Looking for fail-proof egg replacements in your baking and cooking? Follow this guide and make perfect eggless baking and cooking recipes. With replacements for everything from baked goods to custards to savory breakfast dishes, I’ve got you covered! When first going vegan, it can be hard to imagine a life without eggs. Believe me, I know. However pretty quickly you’ll find, just as I did, that eggs are easy to replace in nearly everything and, in truth, eggs turn out to be completely unnecessary. In the decade that I’ve been a vegan I’ve seen amazing progress in the plant-based food movement and one of the most impressive areas is that of the “vegan egg” which continues to gets to expand and get better every year. 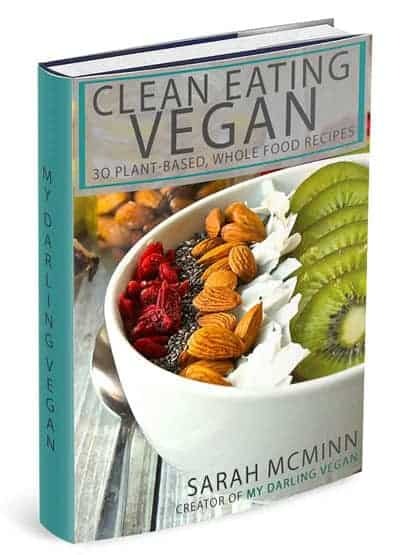 While there are many commercial products out there, this guide is focused on simple, easy to find, solutions for vegan egg replacements for nearly everything. 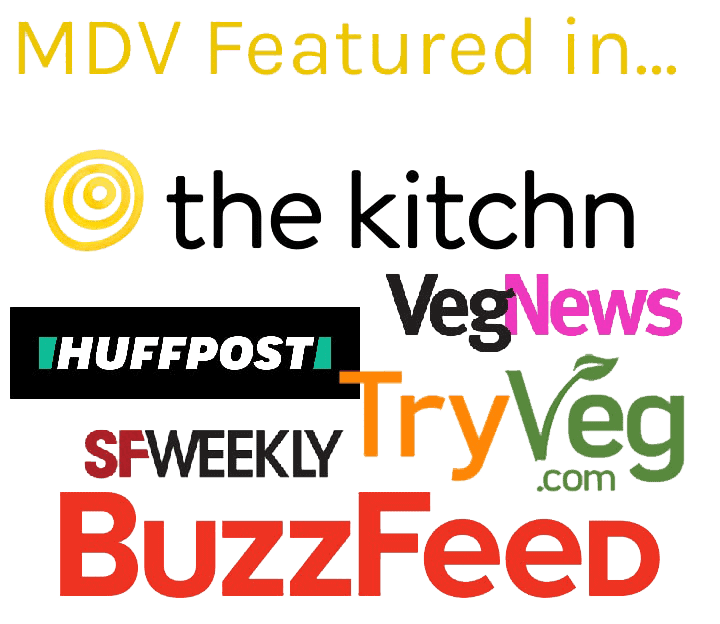 Let’s take a look at some of my favorite vegan egg replacements in baking and cooking. 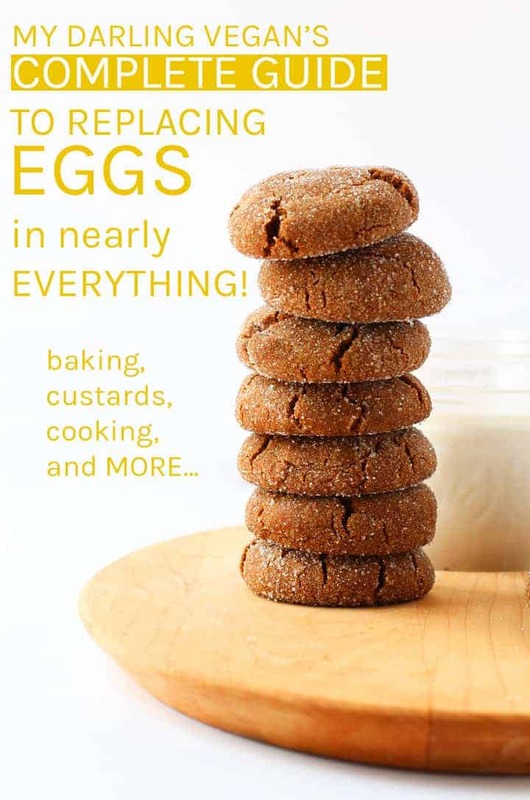 In baking, eggs are most commonly used as leaveners, thickeners, and binders. 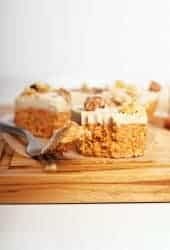 Most cookies, muffins, pancakes, quick-breads, and cakes all use eggs for a combination of these. Lucky for eggless eaters, many plant-based foods have similar properties and therefore do the same thing in simple baked goods. Here’s a list of the most common vegan egg substitute in baking. High in protein, chickpea flour works both as a binder and leavener and, in my opinion, one of the best natural egg replacers for baked goods such as scones, cookies, and biscotti. It is also the ONLY reason this vegan flourless chocolate cake holds together. To substitute: mix 3 tablespoons of chickpea flour with 3 tablespoons of water for each egg, until thick and creamy. Chickpea flour can be found online or in most health stores or bulk sections of well-stocked grocery stores. This includes apple sauce, banana, pumpkin, and sweet potato puree. Purees work as binders and thickeners and are perfect for moist, dense, baked goods such as muffins, doughnuts, and quick bread. To substitute: add 3 tablespoons of puree for each egg. Note: purees do not add leavening properties and in some cases make batter denser. When using, add about 1/8th teaspoon baking soda (per egg) to the recipe to help with leavening. Without adding additional flavors (unlike fruit purees) yogurt is a great substitute for binding and thickening. To substitute: add 1/4 cup plain non-dairy yogurt or silken tofu for each egg. Like purees, yogurt and tofu have no leavening properties, so in most cases, you’ll want to add about 1/8th teaspoon baking soda (per egg). Great for most baked goods such as muffins, bread, and cookies, flax and chia seeds are amazing plant-based egg replacers. 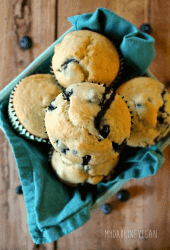 They add many health benefits to your baked goods, without adding additional flavor. To substitute, blend 1 tablespoon of flax or chia seeds with 3 tablespoons of water until mixture is thick and creamy. Flax and chia seeds can be found online and in most grocery stores and should be stored tightly wrapped in the freezer. Please note: No egg replacer acts or tastes the same in every recipe so when using recipes will require a little tweaking from these guidelines. New recipes always come with a little trial and error. Ice cream, mousse, pastry cream, creme brûlée, bread pudding, french toast, and cheesecake are all examples of common custards. 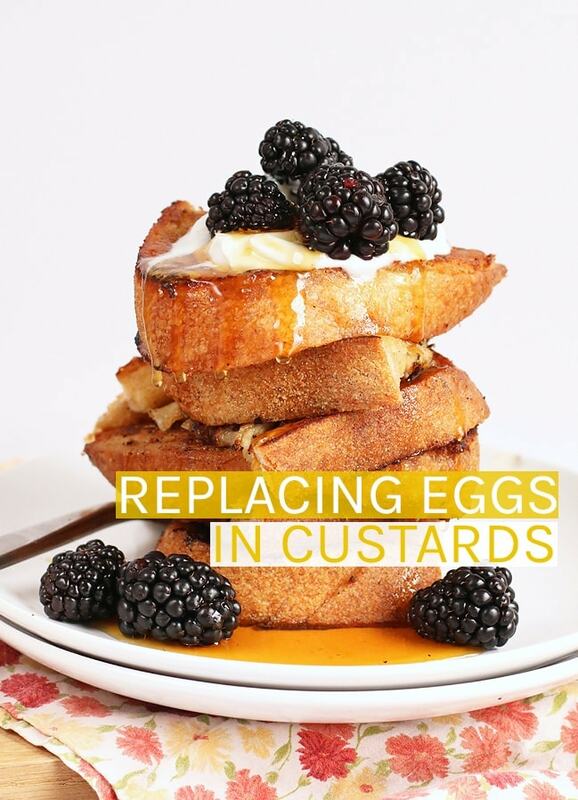 By definition, custards are made through the coagulation of egg proteins. Sounds hard to duplicate? Not at all. Unlike replacing eggs in baked goods, which is relatively easy even for new bakers to veganize, custards are made by a lot of adjustments to perfect texture and taste, making a direct substitution for every recipe impossible. That being said, with some trial and error, you too can make your own vegan egg substitute for classic custards. Fatty and thick, coconut milk can be used to replace whipped egg yolks. Most ice creams are made whipping egg yolks which gives it the texture, body, and richness associated with ice cream. This 5-Ingredient Coconut Milk Ice Cream substitutes coconut milk for both the eggs and heavy cream, making it so creamy, airy, and thick. Raw cashews, soaked and ground to a VERY SMOOTH cream, have very similar properties – high in fat and protein – to whipped egg yolks making it one of my favorite ways to make custards like Panna Cotta and Pot de Creme. Virtually flavorless, the cashew nut remains a hidden ingredient, taking on the flavors surrounding it. For a healthier version, well-blended tofu will take on any flavor, and can be used instead of cashews in puddings, pudding cakes, and cream pies. This is a cheaper, lower-calorie version to using cashews. As a strong gelling agent, the use of agar powder creates similar coagulation that allows custards to “set-up”. It is best used in creams such as pastry cream and Bavarian cream. It can be found in the baking aisle in a natural foods grocery store. Because of its high protein content, chickpea flour has awesome coagulation powers when baked. When few eggs are required rather than being the base of the recipe, chickpea flour may be the best option. For example, when making French Toast or Bread Pudding. A relatively recent discovery, aquafaba is the liquid from canned bean (usually chickpea). When whipped up it is similar to whipped egg whites. These work incredibly well in mousses, meringues, and other recipes that rely on the tender texture that whipped egg whites create. If you haven’t tried aquafaba yet, you’ll be amazed. Even classic egg dishes can be made with a vegan egg substitute and remain delicious. Quiche, Frittata, and Omelettes can all be recreated with a few plant-based ingredients! Tofu is one of the most used egg replacers. It is best used in scrambles, quiches, and egg salads. When using tofu in eggy dishes it is almost always best to use regular firm tofu to replicate an eggy consistency. Check out my recipe for perfect scrambled “eggs” to check out the process. 1/4 cup of tofu equals approximately 1 egg. With surprising similar texture and flavor to eggs, chickpea flour has become a common substitution for omelets and quiches. This is a method I haven’t tried personally but is very commonly found in recipes these days. Adding little additional flavor, whipped up beans are high in protein and can create a similar texture to beans when baked in frittata or quiche. Chickpeas also make a nice soy-alternative to a scramble. Hi! This post is awesome, thanks! My son was recently diagnosed as allergic to eggs (and several other foods) so I’m desperately trying to figure out how to make my mom’s Passover rolls safe for him (or at least for people to eat around him). Eggs are a very important / prominent ingredient. 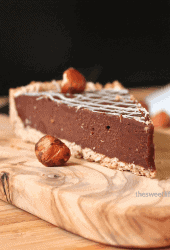 I was going to try aquafaba (surprised you don’t have that listed – you should check it out! Apparently it’s amazing!) but then read it’s not great in recipes calling for more than 3 eggs. Do you think chickpea flour would be the best substitute? Maybe a combination of chickpea flour and silken tofu? I considered applesauce but don’t think I can use baking powder. Here’s the base recipe, per my mom’s memory. Would love your input! Cool, then add 6 eggs one at a time. make balls and bake at 350 for ?? ?40-60 min??? Anything I can use to replace 2 large egg whites in a souffle? Thanx for your help I have not tried any eggless replacers other than agar strips will try your recipes very soon. Hi! Can I use flax seeds in he dough to make donuts? will that work? Yes, flax seeds would work as an egg replacer in donuts. 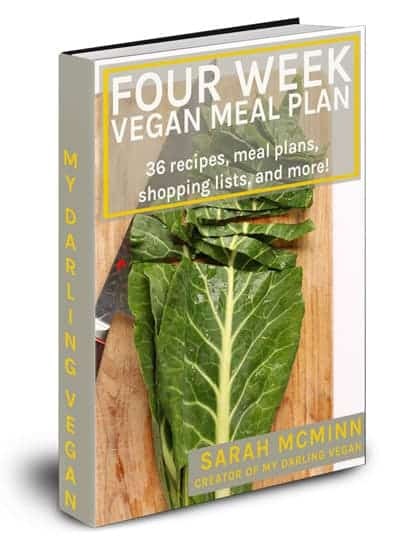 Hi Sara – since my last contact I have been experimenting with chick pea flour. I found it very inexpensive in Indian markets under a different name, Besan Flour. Saving grace though – check ingredients and it listed only chick peas. I’ve found that my treatment of chick pea prep has made all the difference. If I over mixed it, my biscotti was dry. It was better with just combining equal parts of chick pea flour and water until almost completely blended with some very small pieces not dissolved. And now I’ve just tried it with the basic QO oatmeal cookie recipe and by using 2 part chickpea flour to 1 part water and using my combining method, I was able to get this no egg cookie chewy just like the regular ones. I’m ready to try Chick pea flour in an egg omelette! What should the proportion be? This is the recipe I used to make the crumble but like I said above it just didn’t bind. I recently made a crumble with 2 cups oats, handful of walnuts, 5 tbsp almond flour and 1 tsp of flax seeds with 5 tbsp maple syrup and 5 tbsp of coconut oil. Although it tasted nice, the crumble didn’t bind together at all and did not stick to the fruit beneath it. Do you have any suggestions as to what I could do to make it bind next time ? My best guess is the crumble needed more liquid. Perhaps add a little more coconut oil or water. The crumble should stick together when pressed between your fingers. 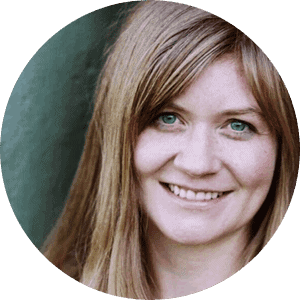 Hi – love this post – very helpful! I also volunteer and cook at a Buddhist temple and your ideas are helping me with my cooking there as well. I would like to make french toast for Christmas morning. Do you think the thick coconut milk will work as a replacement for the egg yolks? Thanks so much! Hey Vickie, here’s my recipe for french toast: https://mydarlingvegan.com/classic-french-toast-with-homemade-challah/ I use chickpea flour as the egg replacer. I’m not sure about coconut milk, it would definitely be strong in flavor, for better or worse, and it also might not fry up as well as something like chickpea flour. I’ve also seen recipes using chia seeds as egg replacer and flaxseeds. Good luck! 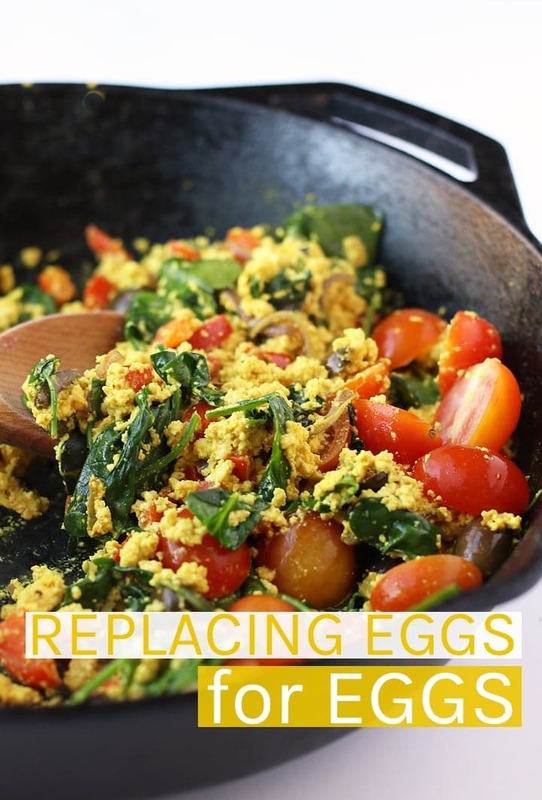 Thanks you for this lovely write up on countless ways one can substitute eggs in recipes. Oh this is great. What should be a great or good substitute for my banana cream pie? What recipe are you talking about? Wow. That must be hard. I imagine you could use cashews to make a quiche base, although it would need something to make it light and would involve a lot experimenting to get that one right. Quiche is a hard one because it usually uses tofu and chickpea flour to help get the right consistency. In terms of breads, you could try applesauce or bananas for the binder, this will vary depending on what kind of bread you want to make, but should work for many. Good luck. I want to do this recipe. What egg replacements would you recommend for qn egg heavy cake like this. This one is tricky because of the whipped egg whites. I think to replicate a recipe like this would take a huge recipe overhaul. It looks amazing though and if I think of something I’ll let you know! Hey Kristina. You could try my challah recipe.http://www.thesweetlifeonline.com/2012/10/10/vegan-challah/ Or at least try substituting the egg yolks with chickpea flour as I do with the challah. Good luck! let me know if you try it! Thanks for your reply, Sarah! I will test it with chickpea flour. Just not sure what ratio to use. It’s gonna be an interesting test baking 🙂 I’ll let you know how it goes. THANK-YOU for the chickpea flour tip! I haven’t had good luck with flaxseeds in the vegan loaf kinds of things I’ve been trying to make for my picky eaters (also gluten and soy free). I’ve never heard this before, but I’ve had chickpea flour in my pantry forever, and usually use it to make socca and the like. I bet it’s sticky enough–protein and fatty enough–to really bind. great blog! I’d live to bake a “safe” cheesecake for my food-agergic son, but I can’t stomach coconut in any form. Plus, he’s allergic to soy. Flaxseed is my egg-replacer in baked goods, but I get the feeling that it will do zip to bind cheesecake. I will try with the egg replacer and I will let you know how that goes 🙂 thanks for reply so quickly!!! how about the egg substitute to homemade icecream ? I have always had to alter ice cream quite a lot rather than just subbing out eggs, but vegan ice cream can certainly be delicious! Ener-G Egg Replacers makes a similar meringue when whipped up. I have tried this method making angle food cake this way. The texture wasn’t perfect, but I think for a souffle it might work. I think for the most part finding the perfect substitute for whipped egg whites is still a work in the process. You could try using coconut oil, since it is solid at room temperature, but I’ve never tried that. You could also try ener-G egg replacer which whips up like whipped egg whites, but I also don’t know how that sets. I’m sorry I couldn’t be more helpful! Whipped egg whites are a hard one to replace. I’ve found that potato flour works wonders for a custard texture particularly in a pumpkin pie. I use it for a binder and flax seed to give it the pretty shiny look on the top. Potato flour also works as a great binder for patties etc. I recently made a stuffing casserole for Thanksgiving. It needed approximately 3 Tablespoons of potato flour to replace the eggs as a binder. Awesome! Thanks for sharing. I will definitely try this out soon. First, thank you so much for this guide! I’m an omnivore, but I have a vegan friend, so when I bake I bake vegan for her. Anyway, if just replacing egg whites (say, in this recipe: http://www.food.com/recipe/low-fat-double-chocolate-chip-cookies-187227), what would be the best replacement? I checked out the recipe and don’t see why they just used egg whites unless if was for health reasons – which it likely was. For that reason I would think the best substitute would be about 2 tbsp apple sauce or vegan yogurt. I would also add about 1/4 tsp baking powder to the recipe to help it rise. Good luck! Let me know how it turns out! Thank you!!! I just baked these this morning and they turned out great! I used the applesauce, but I ended up using more than 2 tbsp (but unsure how much–I just added until they batter was the right consistency). They stuck together and were moist. The vegan member in my cast hugged me for them. Any tips on how to veganize a recipe that calls only for egg yolks? For instance, I have a recipe for coconut chiffon cake and it calls for 6 egg yolks. Any help would be awesome. Thank you! Can you send me a link to the recipe so I can look at it? If it calls for the egg yolks to be whipped that would be different than just added to the batter one by one. Chiffon cake is very hard to make vegan – I have never successfully done it. But there is this product: http://thevegg.com/ that might do the trick, especially if it calls for whipping the egg yolks. Either way send me the link and I’ll try to help! I’ve never thought about making pate choux…but I imagine it could be done. I think your best bet would be using a commercial egg replacer (Bob’s Red Mill has a good brand) because that stuff works best in baked goods. I’m not sure exactly how it would work since eggs are so essential in Pate Choux that it might take a combination of things. If you try it with commercial egg replacer, let me know how it turns out! This has been ultra-helpful for me this holiday. I am considering investing in a high end blender like Vitamix. Do I need this for pureeing tofu in baking and for cheese-like items like ricotta? We can’t have any tree nuts (i.e. cashews) so using tofu is essential for me. My current blender is a 7 year old Kitchen Aid that does not purée things too well. Thanks and happy holidays! Tofu doesn’t need anything special to puree because it is so soft to begin with. When using tofu as egg replacer, you want to use silken tofu which is so soft you would hardly need to process it. When making cheese like items, a food process would be just fine because it doesn’t need to be completely smooth. So while your kitchen aid works just fine for tofu, I do believe a high end blender is a good investment for juices, smoothies, and many more things. Happy New Year! Great post, my daughter is a vegan and we have had great success with Flax so far, but looking to try some other alternatives. Blondies never turn out right and now I am guessing its because I am not adding that extra leavening agent. My DREAM is to find a good marshmallow recipe, have you ever had success in that area? Camping is a real bummer without s’mores. I have purchased some at the co-op in town but they were a sticky clumpy mess. I don’t have a good vegan marshmallow recipe unfortunately. When I want to eat them, I buy dandies, but they aren’t the same. It’s something I hope to work on with time. 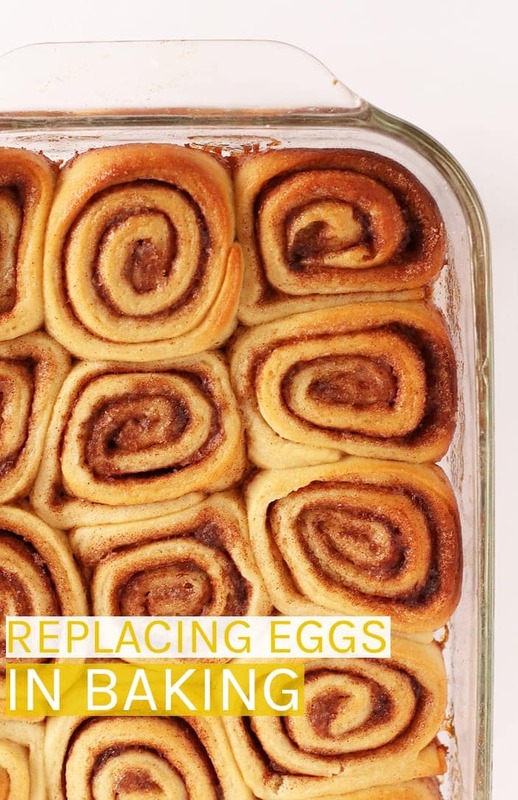 Do you have any suggestions for an egg replacement on top of baked goods like cinnamon buns- I forget what it’s called, but it gives a glaze effect and makes them shiny? Soy creamer or soy milk will create a shiny appearance. And sometimes for breads (such as my vegan challah) i will light brush on some oil after it’s done cooking for the shiny effect. Thank you so much for this blog entry! This helps a lot!! AWESOME post! My favorite is chia! I need to try chia. I keep reading about it but just haven’t used it. Once I do I’ll add it into this post! I find checkpea flour very helpful in many recipes and now I know why after reading your blog :). I used to have a hard time finding it few years ago until I found out it’s known by other names like: besan, gram flour, Channa flour. Now it’s available in a lot of stores as more people are using it. Thanks for all these helpful tips! I’m looking forward for your next blog.